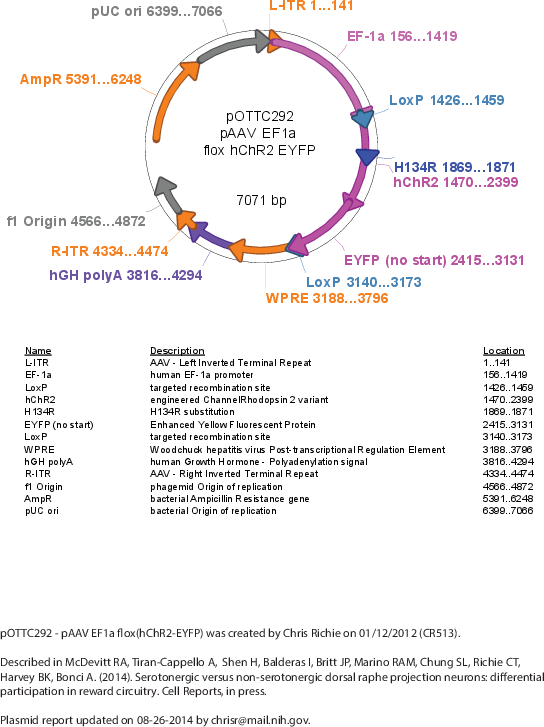 An AAV packaging vector that expresses channel rhodopsin 2 (H134R) (fused to EYFP) under the EF1a promoter, which can be deactivated (deleted) by recombination between the flanking loxP sites. Removed double floxed inverted open reading frame (hChR2-EYFP) using KpnI and EcoRI digestion. Used In-Fusion cloning to recombine backbone with PCR-based insert (KpnI-loxP-hChR2-EYFP-loxP-EcoRI). 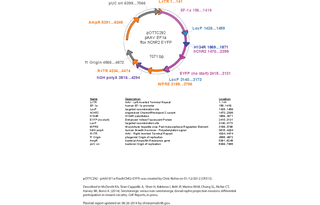 The ORF for hChR2-EYFP, and the AAV vector backbone was obtained from Karl Deisseroth, but is also available from Addgene (Plasmid 20298).